I have a confession to make. 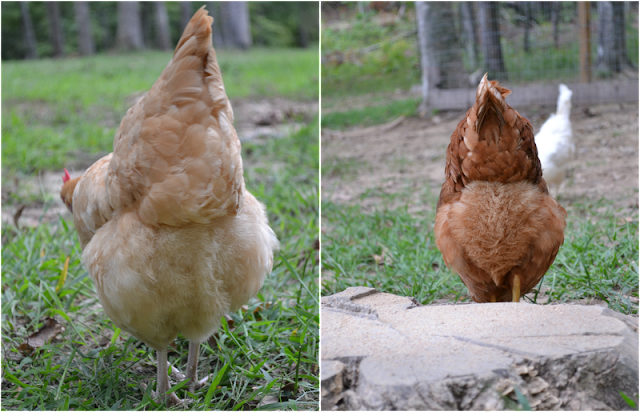 I love chicken butts! They are big, soft, fluffy and beautiful. Turns out, there is a reason for all that fluff. When a pullet is mature and starts laying eggs, her fluff really starts to grow and get thick. This is in preparation for motherhood as newborn chicks stay under their mother's bottom to keep warm until they get their own feathers. Our new pullets just started to lay within the last month, so their fluff is at maximum capacity! They look so good all feathered out with big, fluffy bottoms. I think they're getting tired of me patting their butts, but I can't help it! This post is linked up to Coop Hop #2. Your chicken's butts are lovely! I call them "bloomers." Why thank you! I think I'll have to call them bloomers from now on; I love that!